Chicken burgers are a lot lighter tasting than beef burgers. These burgers use Asian herbs and spices for lots of added flavour and sunflower seeds for a healthy crunch. Make sure the burgers are thoroughly cooked if you barbecue them. Serve with a tossed salad of mixed greens and watercress. I have used the recipe for a nice meatloaf and for slicing later in sandwiches. Excellent for mini meatballs for appetizers and in soups. Line a baking sheet with parchment paper. Place chicken, sunflower seeds, green onions, ginger, cilantro and soy sauce in a large bowl and mix by hand until well combined. Place a 4 inch ring mould or cookie cutter into the baking sheet. Spoon enough of the chicken mixture into the mould and fill it 1/2 inch full. Repeat until you have 4 equal rounds. The burgers can be covered and refrigerated for up to 3 hours. Preheat the barbecue to high heat. Just before grilling, brush burgers with olive oil and season with salt and pepper. Reduce the heat to medium and grill burger for 5 to 6 minutes per side. Check for doneness with a meat thermometer: the internal temperature of the meat should be 160 degrees F.
If you prefer, these burgers can also be fried. Preheat a frying pan on medium heat and then add 2 Tbsp of oil. Place the burgers in the pan and cook until the bottoms are browned, 4 to 5 minutes. Turn them over and continue cooking until they are firm to the touch, another 5 to 8 minutes. In a small bowl, combine mayonnaise and wasabi paste. Set aside. Gently toast hamburger buns on the grill. Spread each half with some of the wasabi-mayonnaise mixture, then place a hot hamburger on the bottom half of each bun. 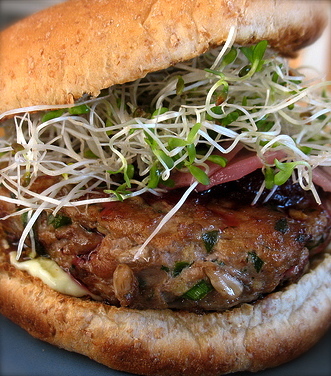 Top the burgers with 1 Tbsp alfalfa sprouts, a dollop of Beet Ketchup, a few slices of pickled ginger and the top half of the bun. This entry was posted in Uncategorized and tagged Beets, Chicken. Bookmark the permalink.